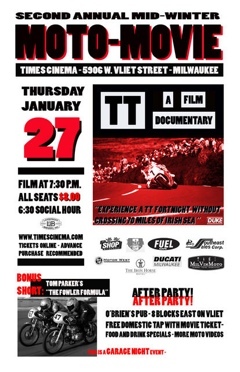 On January 27 I attended the Milwaukee Mid-Winter Moto Movie Night. The organizer, Kevin Knuth, had contacted me a couple months earlier asking if they could screen my film The Fowler Formula as an opener for the feature documentary TT. A chance for a crowd of vintage fans to see The Fowler Formula? An excuse to visit my old stomping grounds in Chicago? An opportunity to hang out with some old friends? I deliberated for about 30 seconds before saying yes. I decided to bring a surprise with me to movie night. I started going through the footage I had — we had only interviewed Joe Seifert and Kenny Dreer at this point — and cutting together a trailer for the MMWMMN. I ended up with a special, one-night only trailer just for them. It was a great night. Kevin had asked if I wanted to introduce the film and I’d agreed. But wow — this was the largest single group of motorcycle fans to see the film yet, and maybe the largest group of any kind. I started to get a little nervous. And right before we were ready to start, a friend leans over and whispers, “Hey, did you see Peter Egan is sitting right behind us?” What? Egan’s here?! He’s going to watch my film?! Fortunately, we got started before I had time to panic too much. I stumbled through some opening comments and we showed my short and the American Norton trailer. The crowd response was great, TT was a lot of fun, and I think everyone had a blast. I want to thank all of you who came up to me after the screening and had such kind words to say about my film. You all help keep me inspired and keep us hard at work on American Norton. For those of you who are anxious to see what we’ve done so far, I apologize. I’m not trying to be a jerk. As I said, the trailer for MMWMMN was sort of a one-night only cut. I’m still working out what music we can clear for a trailer we post on the Internet. I appreciate everyone’s patience and we’ll get something up as soon as possible. Until next time, thanks for all the support! Can’t wait to see the trailer. Paul, it’s too bad you didn’t make it to movie night. It was a great time. Thanks for continuing to spread The Fowler Formula to new viewers. I’m working on getting a new cut of the trailer up soon.